Standard back boxes can be re-used in many circumstances through the use of our color matched adapter plates. Real time system status reporting via several intuitive LED patterns (eg. X pattern when DMX is live). Available in scratch resistant white or black textured powder coat finish. 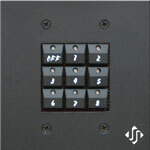 The controls offer a "slick & quick" cost-effective control solution! Designed for use specifically with Johnson Systems CD-2000, QD-2000 and KD-2000 retrofit control systems. These stations will significantly enhance the system capabilities of your retrofitted dimmer rack. Available in single gang 3 preset (CS-2803) or two gang 9 preset (CS-2809) configurations. 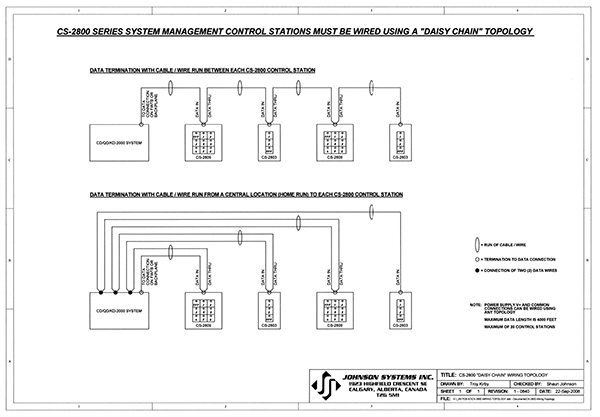 These stations are powered with 12VDC and will operate off of existing building wiring (virtually any three conductors). DMX snapshot record and playback. Real time system status reporting via intuitive LED patterns. System diagnostic and much more. No electrical contracting is required, these stations will install in standard electrical back boxes. Rugged hi-grade aluminum finished in durable fine texture, non-reflective, black powder coat finish. Heavy-duty pushbutton switches, rated at five (5) million operations minimum. All programmed preset data is stored in non-volatile RAM with full redundancy back up to 100 year EEPROM. Black or White Nine preset, two gang master control station. Black or White Portable nine preset, two gang control station c/w 15' control cable. Requires Simplicity receptacle module #RM-4F. Black or White Three preset, single gang entrance station. Black or White Dry contact interface PCB for building management interface. Black or White Signal repeater for data runs exceeding 4000' or "starred" wiring topology. NOTE: Orders not specifying color will have black shipped. Cover plates are a non-returnable item.